The upper Dolpo trek duplicates the mysterious and spiritual complexion in the hidden valley that lies in western Nepal. The region is famous for various rare found animals including snow leopard and blue sheep. 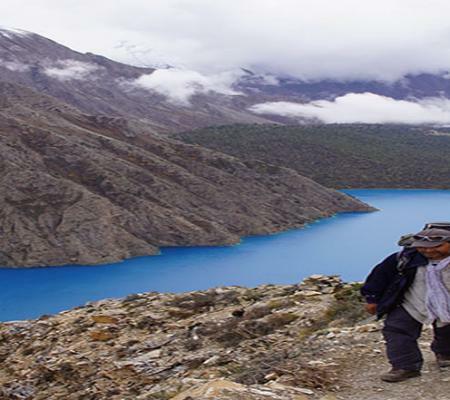 Round Upper Dolpo Trek offers you the sightseeing if the beautiful Himalayas including Dhaulagiri. The trekking trail towards round upper Dolpo goes through various technical high pass and steep roads along with several rhododendron and pine forests. 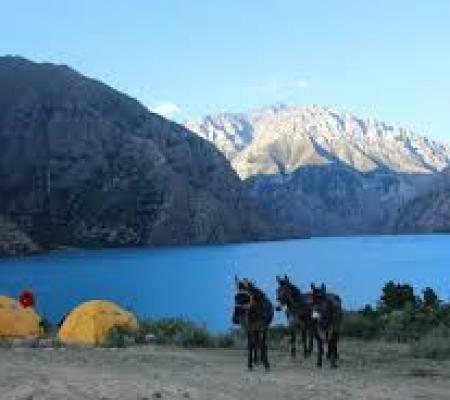 You’ll get the excellent sightseeing of different mountains along with the camping experience throughout the trek. The cultural villages in the way give an outstanding experience along the trekking journey. The journey of the round upper mustang trek begins after your arrival in Kathmandu. After the sightseeing of various religious and historical sites in Kathmandu, we take a flight to Nepalgunj and then towards Jhupal. The flight goes over various beautiful mountains views and local settlements. We begin our trek from Jhupal towards Dunai. The trail goes through the mountain region along with the rain shadow area. We follow the path of Renje via Akhe, We’ll visit Phoksundi National Park in Ankhe that consists of various flora and fauna that are only found in Nepal. 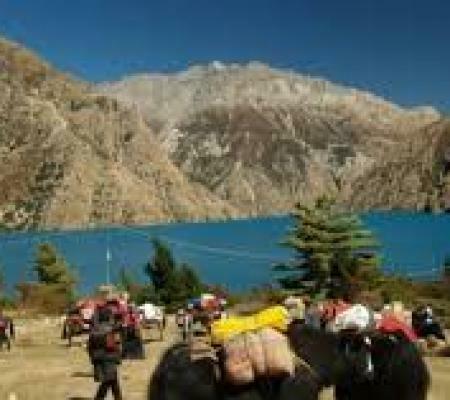 On further walking, we reach Phoksundo Lake which is one of the most beautiful lakes in Nepal. After exploring the Phoksundo areas, we continue our trek towards Shey Gompa and then towards Saldang la Pass. Walking through several villages, we reach Dho Tarap where you can experience the Tibetan culture. We pass through various places including Serkam, Khani Gaon, and Tarakot and cross several suspension bridges on the way. We walk towards Nepalgunj via Dunai. We have a drive or flight towards Kathmandu from Nepalgunj. Our journey ends back in Kathmandu. Day 1: Arrival in Kathmandu Airport and Transfer to Hotel in Kathmandu. Day2: Discussion about trekking and Half day Sightseeing in Kathmandu Valley. Day4: Fly from Nepalgunj to Juphal and trek to Dunai(2,140m.)4h. Day5: Trek from Dunai to Tarakot(2,537m.)6-7h. Day6: Trek from Tarakot to Laina Odar(3,370m.)7h. Day7: Trek from Laina Odar toSisula (3,756m.)6-7h. Day8: Trek fromSisula to Dho-Tarap(3,944m.)7h. Day9: Day excursion to Dho-Tarap Village. Day10: Trek from Dho- Tarap to Chhoila Bhanjang (5,040m. 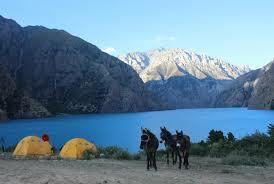 )and Chhoila Base Camp 7-8h. Day12: Trek from Tinjegaon to Shimengaon(3,885m.)5-6h. Day13: Trek fromShimen to Khomagaun (4,210m.)5-6h. Day14: Trek from Khoma to Saldang(3,770m.)5-6h. Day15: Trek from Saldang to Namung Gumba(4,360m.)4-5h. Day16: Trek fromNamung Gumba to Sela Bhanjang(5,095m.) and Shey Gomba(4,343m.)5-6h. Day17: Day excursion in Shey Gomba. Day18: Trek from Shey Gomba toNagdalo pass(5,350m.) and Base Camp(4,600m.)6-7m. Day19: Trek from Base Camp to Phoksundo Khola(3,630m.)6-7h. Day20: Trek from Phoksundokhola to Ringmogaun(Phoksundo 3,641m) 3-4h. Day21: Trek fromRingmogaun to Rechi(3,011m.)5-6h. Day22: Trek fromRechi to Suligad(2,080m.)6-7h. Day23: Trek from Suligad to Juphal(2,475m.)3h. Day24: Fly from Juphal toNepalgung and Evening Kathmandu. Day25: Rest day in Kathmandu. Day26: Departure to your own destination. Major world Heritage sites of Kathmandu. Desert and Landscape and striking Valley; Dho, Saldang, Tarakot. Magnificent views of great Himalayan peaks such as; Mt. Dhaulagiri and Tibetan Peaks. As soon you arrive in Kathmandu, a representative will pick you up and transfer you to the hotel. We’ll visit various religious and historical places in Kathmandu. In the evening, you’ll be served a special dinner that introduces Nepali food culture. Overnight in Kathmandu. Today we will manage you half a day to visit the major world heritage site in Kathmandu Valley. They are; famous Pashupatinath Temple, Temple of god Shiva, Syambhunath also called Monkey temple popular for the great views of Kathmandu Valley, largest Boudhanath Stupa and royal Kathmandu Durbar Square. In the evening, you will be prepared for all the essential factors for further trekking. Overnight at Kathmandu in the same hotel. As the morning arises, we take a sightseeing flight towards Nepalgunj. The flight offers you the beautiful Ariel views of mountains and local settlements. Overnight in Nepalgunj. We again take another flight towards Jhuopal which is also known as Dolpo. We begin our trek from Jhupal towards Dunai. We walk through various mountains along with the region of rain shadow area. Overnight in Dunai. Day 5 : Trek from Dunai to Tarakot (2,537m.)6-7h. Today, after breakfast, we will head towards Tarakot, which is situated at the altitude of 2537m. From Dunai, we walk along the wide route below the Thuli Bheri River and we will decent towards Tarakot. The trail goes through the steep landscape and crosses suspension bridge. Overnight in Tarakot. Day 6 : Trek from Tarakot to Laina Odar(3,370m.)7h. In this day, after morning breakfast, you will follow the Thuli Bheri River and ascend up to Laisicap(2772m) and continue our moderate trail up to Laina Odar. The way to Laina from Laisicap, you can witness one beautiful Chhedhul Gumba and you will get chances to explore it. Overnight at Laina Odar. Day 7 : Trek from Laina Odar to Serkam (3,756m.)6-7h. Today, after breakfast, we will continue our trail towards Serkam, at the altitude of 3756m. Today we will follow a steep ascend trail by following the bank of Tarap Khola we will reach to Serkam. The trail is steep upward with the narrow and crumbly path where you can see Blue Sheep, Marmots, Yaks, Sheep and goats grazing over there. Serkam also offers us various beautiful mountain views that focus us to capture the moments in the camera. Overnight at Serkam. Next morning, after breakfast, we will depart Serkam and follow the trail towards Dho-Trap, which is situated at the summit of 3944m. 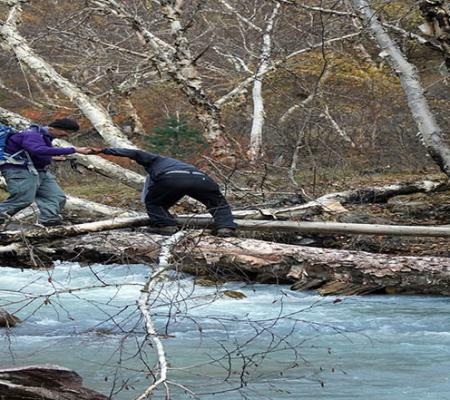 Around 7 hours trek provide you an opportunity to explore small settlement including Dhane, Rechi, Kiptarung, and Rimjo. During your trail, you can view native settlement and encounter with their unique culture and Traditions. Overnight at Dho Tarap. Day 9 : Day excursion in Dho-Tarap Village. As morning rises, we will have breakfast and we will today explore the Dho-Tarap village, word’s highest human settlement at 4080m, where you will get chances to explore the traditional Buddhist culture and also view the traditional architectural design of buildings. While you explore the village Dho-Tarap, you will really feel that you are traveling to Primeval era. Beside this Dho- Tarap also offers us a splendid view of Phoksondo Lake. Overnight at Dho- Tarap. Day 10 : Trek from Dho- Tarap to Chhoila Pass (5,040m.) and Camp Renjon khola Dovan (4,480m.)7-8h. After you explore the Dho-Tarap, today after early breakfast, you will continue gradual ascend trail To Chhoila Bhanjanj, at the 5040m. which also offer us a magnificent view of Dhaulagiri and stunning mountain view. Further gradually down trail leads us to the Renjo Khola Dovan Camp. Overnight at Dovan. Day 11 : Trek from Renjo khola Dovan to Tinje (4,110m.)6h. Today, after breakfast, we will continue to trail small ups and down through the river bank and reach to the Tinje Village. Around 6 hours trail will lead us to the traditional village of Tinje which offers us to visit ancient Gumba, and school. Overnight at Tinje. Day 12 : Trek from Tinje to Shimen (3,885m.)5-6h. In this day, after morning breakfast, we will continue our trail through the Panjang Khola, we need to trek small ups and down to Shimen Village. As you reach the Shimen village, you can visit their agricultural field and Yaks, and Goats are the means of their livelihood. Overnight at Shimen. Day 13 : Trek from Shimen to Khoma (4,210m.)5-6h. Next morning, after early breakfast, we will cross Panjag Khola and make around 400m trail steeply up to Shimen Pass. From Shimen Pass, we can have a stunning view of Khoma Village, Shimen Village, beautiful river, and small mountain view of Tibetan broader. After this panoramic view, we will continue small ups and down and reach to the Khomagaun. Overnight at Khomagaun. Day 14 : Trek from Khoma to Saldang (3,770m.)5-6h. Today, we will directly ascend around 500m towards Khoma Pass, at the altitude of 4555m. the height of Khoma Pass let you have a panoramic view of Dolpa and Tibetan Plateau. From Khoma Pass, we will continue our trail around 1000m down up to Nagon Khola and cross the beautiful river. The further trial will be gradually up through Sugugaon and finally reach Saldang, one of the biggest villages. As you reach to this Village and get chances to explore old Gumba and school. Salt trade from Tibet usually is the main business of the people over here. Overnight at Saldang. Day 15 : Trek from Saldang to Namung Gumba(4,360m.)4-5h. In this day, after breakfast, we will head towards Namung Gumba from Saldang. Today is easy going trail, around 1 hour we need to ascend and slowly down to Namung Gumba. As you reach Namung Gumba, you can do some rest and, in the afternoon, you can visit Namung Gumba and village around. Overnight at Namung Gumba. Day 16 : Trek from Namung Gumba to Sela(5,095m.) and Shey Gomba(4,343m.)5-6h. After morning breakfast, we will continue our trail ascend around 600m up to Sela. On the way to Sele, you will follow the rocky canyon and reach to the flat trail, where you can also witness Himalayan Thar and other wild animals. The further trail will be slightly down around 850m to Shey Gumpa. Overnight at Shey Gompa. Day 17 : Day excursion in Shey Gomba. Today is a rest day at Shey Gomba, and we will explore this tranquil environment of this village. This Gomba is connected to the mountains which are spectacular to view the stunning beauty of Crystal Mountain. Today after lunch we will discover historic Gompa monastery and various Gumba such as; Gamoche Gumba, Taskhang Gumba, Shel Sumdo Gumba. Overnight at Camp. 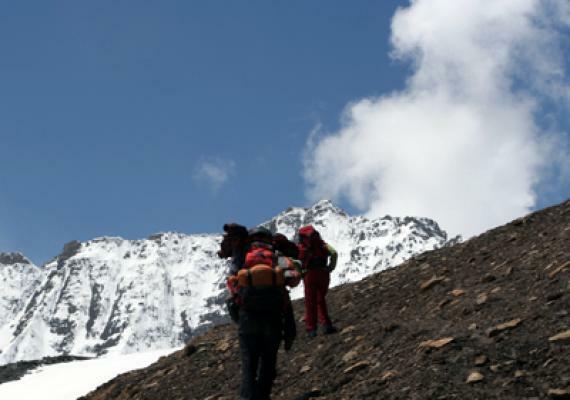 Day 18 : Trek from Shey Gomba to Nagdalo pass (5,350m.) and Base Camp (4,600m.)6-7m. As morning rises, we will have a breakfast, and continue our tail towards Nagdalo Pass. We need to trek around 1200m ascend up and reach to Nagdala Pass. Nagdala Pass provide us magnificent view of Crystal mountain, Kanjiro Himal, and many other breathtaking mountains. Later on, we will descend around 1200m and reach Base camp. Overnight at Base Camp. Day 19 : Trek from Base Camp to Phoksundo Khola (3,630m.)6-7h. After breakfast, we will make a small descend trail and reach Phoksundo Khola. Through this Phoksundo Khola, you will continue walking to Phoksundo Campsite. Overnight at Base Camp. Day 20 : Trek from Phoksundo khola to Ringmogaun (Phoksundo 3,641m) 3-4h. Today, after morning breakfast, we will continue our trail from the right side of Phoksundo Khola, we will walk slightly ups and down on the rocky stone way and reach to Ringmogaun. During the way, you need to cross the Phoksundo Khola most often. Ringmogaun is a big village where you can visit Bon- Gompa. Overnight at Ringmogaun. Day 21 : Trek from Ringmogaun to Rechi(3,011m.)5-6h. Next morning, after having breakfast, we will begin our trek from Phoksundo and make our trail almost descend up to Rechi. On the way to Rechi, you will view stunning rainfall of Phoksundo, and the further trail leads us to the big Settlement of Rachi people where you can visit the hospital (Ayurvedic) and school. Day 22 : Trek from Rechi to Suligad (2,080m.)6-7h. In this day after breakfast, we will continue our trail ups and downs along the forest riverbed. And then we need to ascend through the forest and slop grass. During your trail, you can view fast flowing river below and continue upstream your trail through the rocks and sticks way and finally reach to the Suligad. Stay overnight at Suligad. Suligad-Phoksundo National Park -check post, you can get some information’s about the national park. Day 23 : Trek from Suligad to Juphal (2,475m.)3h. Next morning, after breakfast, we will descend down to Thuli Bheri Khola and cross the beautiful suspension bridge. The further trail will be around 300m ups to Juphal. Overnight in Jhupal. Day 24 : Fly from Juphal to Nepalgung and Evening Kathmandu. Early in the morning, after breakfast, we prepare for the flight towards Kathmandu via Nepalgunj. As you land at Nepalgunj, again you will take a connecting flight to Kathmandu. We catch the beautiful scenes of various mountains and settlements and surrounding just below you, on the way. In the evening, you will be reaching Kathmandu and you can do some rest in the hotel. Overnight at Hotel. Day 25 : Rest day in Kathmandu. Today, we’ll have a rest till lunch. you can go shopping for gifts for your family and friends. In the evening, you can enjoy the farewell dinner program and enjoy the completion of the trek. Overnight in Kathmandu. Our journey of Round Upper Dolpo Trek comes to an end this day. After an early breakfast and hotel checkout, a representative will help you with your final departure. 	Airport Pick up and Drop BY Private Vehicles. 	Air Fare from Kathmandu to Nepalgunj to Juphal and Juphal to Nepalgunj to Kathmandu. Round Upper Dolpo special permit.